Spain: Day 45 of 985 of the Spanish Civil War. Spain: Day 410 of 985 of the Spanish Civil War. CBI - China: Day 55 of 2,987 of the 2nd Sino-Japanese War. Day 18 of 106 of the 2nd Battle of Shanghai. Germany: The Imperial Regalia of the Holy Roman Empire arrives from Vienna, Austria, to St Catherine's Church in Nürnberg, Germany. Items in this collection include both ceremonial items used by Holy Roman Emperors (the Imperial Crown, the Imperial Orb, the Imperial Sword, etc) as well as relics of Christian mythology (a wood splinter said to be from the cross upon which Jesus was crucified, the spear blade said to have pierced Christ's side at the crucifixion, etc). Spain: Day 775 of 985 of the Spanish Civil War. CBI - China: Day 420 of 2,987 of the 2nd Sino-Japanese War. Day 81 of 139 of the Battle of Wuhan. Japanese bombers attack the airfield near Guangzhou. Poland: Poland refuses to dispatch a delegation to Germany to negotiate over the topics of Danzig and the Polish Corridor. CBI - China: Day 785 of 2,987 of the 2nd Sino-Japanese War. CBI - Mongolia: Day 112 of 129 of the Battle of Khalkhin Gol, a border dispute between the Soviet Union and Japan. Atlantic: German sub U-32 sinks three ships in an Allied convoy 4 miles off Isle of Lewis, Scotland; the British ships MILL HILL, CHELSEA and the Norwegian ship NORNE. Atlantic: German sub U-25 hits one of her own mines and sinks near Terschelling, Netherlands. ETO - UK: Day 52 of 114 of the Battle of Britain. The Luftwaffe changes tactics by attacking constantly throughout the day with smaller formations. Many airfields, radar stations and towns are hit. This becomes RAF Fighter Command's worst day for casualties. During the night, all major cities in England are hit. ETO: The RAF bombs the German capital of Berlin and oil refineries near Rotterdam in the Netherlands. Germany: In exchange for a German guarantee of security, Romania cedes the region of Dobrudja to Bulgaria and Transylvania to Hungary. This move has been forced upon Romania by Hitler in an effort to prevent a possible war between Romania and Hungary. East Africa: Day 82 of 537 of Italy's East African campaign in the lands south of Egypt. CBI - China: Day 1,151 of 2,987 of the 2nd Sino-Japanese War. Day 290 of 381 of the Battle of South Guangxi. Day 11 of 42 of the Hundred Regiments Offensive. CBI - Indochina: The Japanese military begins to occupy the ports, airfields and railroads in northern Indochina as agreed to yesterday by Vichy France. Russian Front - Finland: Day 63 of 142 of Operation SILVER FOX, a joint German-Finnish campaign to capture the Russian port of Murmansk in the Arctic. Russian Front - Finland: Day 61 of 140 of Operation ARCTIC FOX, a joint German-Finnish campaign against Soviet Northern Front defenses at Salla, Finland. Russian Front - Finland: Day 70 of 164 of the Battle of Hanko. The Soviets continue to withdraw from the Karelian Isthmus back to Leningrad. Russian Front: Day 70 of 167 of Germany's Operation BARBAROSSA, the invasion of the USSR. Russian Front - North: German Army Group North captures Mga, southeast of Leningrad, thus severing the last railroad leading into the city. Russian Front - Center: Day 14 of 23 of the Battle of Dukhovshina, Russia. Russian Front - Center: Day 1 of 10 of the Battle of Yelnia, Russia. Russian Front - Center: Day 1 of 14 of the Battle of Roslavl-Novozybkov, Russia. Russian Front - Center: Day 38 of 38 of the Battle of Gomel, Belarus. The Germans capture Gomel. Russian Front - South: Day 8 of 35 of the 1st Battle of Kiev, Ukraine. Panzer Armies of German Army Groups South and Centre begin encircling Kiev. Russian Front - South: Day 23 of 70 of the Siege of Odessa, Ukraine. Romanian troops capture Kubanka but the Soviets will recapture it later in the day. MTO - Libya: Day 143 of 256 of the Siege of Tobruk. Middle East: Day 6 of 24 of the Anglo-Soviet invasion of Iran. East Africa: Day 447 of 537 of Italy's East African campaign in the lands south of Egypt. CBI - China: Day 1,516 of 2,987 of the 2nd Sino-Japanese War. ETO - Luxembourg: The formal annexation of Luxembourg into the Reich leads to a general strike. Use of French accents in the written Luxembourg dialect are now subject to fines. Russian Front - North: Day 357 of 872 of the Siege of Leningrad. Russian Front - North: Day 118 of 658 of the Siege of the Kholm Pocket. Russian Front - Center: Day 32 of 64 of the 1st Battle of Rzhev-Sychevka, Russia. Russian Front - South: Day 8 of 165 of the Battle of Stalingrad, the bloodiest battle in human history. Russian Front - South: Day 64 of 150 of Germany's CASE BLUE. MTO - Egypt: The Axis troops launch a new offensive at El Alamein and immediately run into resistance from the air by the Desert Air Force. MTO - Libya: US B-24s bomb docks and jetties in the harbor of Tobruk. East Africa: Day 118 of 186 of the Battle of Madagascar. CBI - Burma: US B-25s bomb the airfield at Myitkyina for the first time. CBI - China: Day 1,881 of 2,987 of the 2nd Sino-Japanese War. Day 108 of 124 of Japan's Zhejiang-Jiangxi Campaign, launched to punish anyone suspected of aiding the Doolittle raiders in China. Roughly 250,000 Chinese will be killed. PTO - Alaska: Day 85 of 435 of the Battle of Kiska, Aleutian Islands. US troops land on Kuluk Bay on Adak Island to establish air and naval bases. PTO - Malaya: Day 193 of 357 of the Battle of Timor Island. PTO - New Guinea: Day 41 of 119 of the Battle of the Kokoda Track. US 5th and 13th Air Forces provide air support. The Japanese continue driving over the Owen Stanley Range toward Port Moresby. PTO - New Guinea: Day 6 of 14 of the Battle of Milne Bay. PTO - Solomon Islands: Day 24 of 187 of the Battle of Guadalcanal. US 5th Army Air Force provides air support. More US Marine fighters arrive at Henderson Field. During the night, more Japanese reinforcements land on the island. PTO - Solomon Islands: The USS COLHOUN is sunk by Japanese warplanes off Guadalcanal. ETO - Denmark: The Danish Prime Minister Erik Scavenius refuses to serve under the Germans. ETO - France: US 8th Air Force B-26s bomb an ammunition dump in France. Russian Front - North: Day 722 of 872 of the Siege of Leningrad. Russian Front - North: Day 483 of 658 of the Siege of the Kholm Pocket. Russian Front - Center: Day 14 of 48 of the Battle of Bryansk, Russia. Russian Front - Center: Day 24 of 57 of the 2nd Battle of Smolensk, Russia. Russian Front - South: Day 7 of 122 of the Battle of the Lower Dnieper River in Russia. Russian Front - South: Taganrog, Russia on the Sea of Azov (Black Sea) is evacuated by the Germans. MTO - Italy: The Allied Air Forces attack a variety of targets in Italy. CBI - China: Day 2,246 of 2,987 of the 2nd Sino-Japanese War. US 14th Air Force attack a number of targets in China and shipping near Hong Kong. PTO - New Guinea: Day 131 of 148 of the 2nd Battle of Lae-Salamaua. US 5th and 13th Air Forces provide air support. PTO - Solomon Islands: Day 16 of 56 of the Battle of Vella Lavella. US 5th and 13th Air Forces provide air support. ETO - UK: Day 79 of 86 of the V-1 "Buzz Bomb" offensive on Britain. ETO - France: The US 3rd Army is ordered to continue east until their tanks run dry and from that point, to advance on foot, in order to get across the Meuse river. ETO - France: Day 30 of 284 of the Battle of Brittany. ETO - France: Day 16 of 32 of Operation DRAGOON, the Allied invasion of southern France. US and French troops continue racing up the Rhone Valley. ETO - Germany: While docked at port at Stettin, submarine U-869 loses one crew member to British bombing when several bombs hit the barracks where the crew is bunked. ETO - Germany: US 8th Air Force B-17s bomb the U-boat base and shipyards at Kiel and industrial targets in Bremen. Russian Front - North: Day 21 of 28 of the Battle of Tartu in southeastern Estonia. Russian Front - South: German troops begin withdrawing from Bulgaria. MTO: US 15th Air Force bombs targets in Yugoslavia. MTO - Italy: Allied troops continue pressing the German line holding the Po Valley. Allied Air Forces provide air support. Canadian units attack west of Pesaro but are beaten back, losing 32 of their 50 tanks in the process. CBI - Burma: Day 152 of 302 of the Chinese Salween Offensive. US 10th and 14th Air Forces provide air support. The British 36th Division captures Pinbaw during a monsoon. CBI - China: Day 2,612 of 2,987 of the 2nd Sino-Japanese War. Day 136 of 259 of Japan's Operation ICHI-GO. PTO - Caroline Islands: US 7th Air Force bombs on Yap and Pagan Islands. PTO - Dutch New Guinea: Day 60 of 61 of the Battle of Noemfoor. Although the island has been declared secured, bitter fighting from Japanese continues. PTO - New Guinea: Day 260 of 597 of the Battle of New Britain. US 13th Air Force provides air support. PTO - New Guinea: Day 131 of 481 of the Battle of Western New Guinea. 5th Air Force provides air support. PTO - New Guinea: Day 78 of 80 of the Battle of Lone Tree Hill. 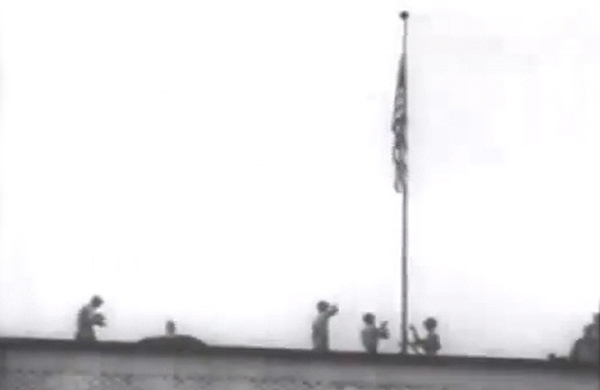 Japan: General Douglas MacArthur flies into Tokyo and is driven to the US Embassy where the American flag that had flown over the US Capitol on 07 Dec 41 is ceremonially raised. The same flag had also been raised over Rome and Berlin upon their captures and now symbolizes total victory over the three major Axis powers. When President Truman announced Japan's capitulation, he placed General of the Army Douglas MacArthur in charge of the surrender and occupation of Japan, under the title Supreme Commander Allied Powers (SCAP). Though the first two weeks of this mission were directed from Manila, on 30 Aug 45 MacArthur flew to Japan, arriving at Atsugi airfield outside Tokyo to begin formalizing the surrender. Saluting the American flag as it was raised over the US Embassy in Tokyo was his first action there. 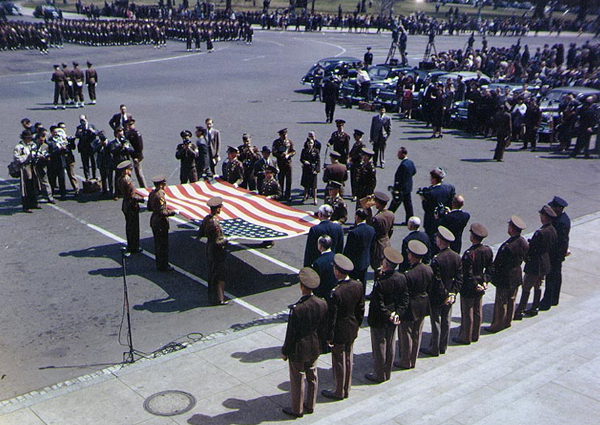 The US flag which flew over the Capitol at the time of the Pearl Harbor attack is returned to the Capitol on 06 Apr 48, after having been raised over the three defeated Axis capital cities, Rome, Berlin and Tokyo. Senator Arthur Vandenberg of Michigan accepts the flag. China: A British battle squadron led by the aircraft carrier HMS IMDOMITABLE enters Hong Kong to reoccupy the Crown Colony. Japan: Two Japanese submarines, the largest in the world, surrender in Sagami Bay after completing their first and only operational trip. Japan: The US occupation troops in Japan report that they get "obsequious bows and smiles" from Japanese soldiers and civilians alike. CBI - China: Day 2,977 of 2,987 of the 2nd Sino-Japanese War. Day 22 of 25 of the Soviet Invasion of Manchuria. Zang Shiyi is captured by Soviet troops.